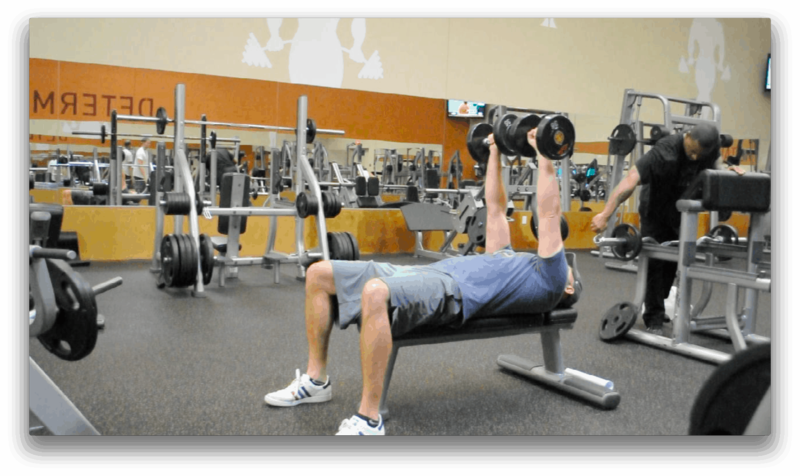 stop doing bench presses (and do these instead) - Golf fitness training and workout programs based on functional fitness. Couple of weeks back, one of our Get Golf Fit members was inspired by Brooks Koepka to do the bench press. I’m sorry but that’s trainer neglect (I’ll explain why below). The first thing a trainer swears is to “do no harm“. It was a staged stunt by the trainer to get Instagram views for personal gain, to the detriment of his client. I want my golfers to feel better, play better, and NOT HURT THEMSELVES. Ahhh… the 1980’s and 90’s. Our member re-aggravated his rotator cuff bad thanks to the Instagram inspiration… which is a fairly common injury on the straight bar press. The flat bar does not give any leniency to your shoulders. Once you grab that straight bar, you are locked in on a predetermined glide path you can’t change… the lower you go, the worse it is on your shoulders. Secondly, guys take the bar way too low where their shoulders are put in a high risk situation. Third… guys use too much weight. Our member is out a few weeks thanks to the good old bench press. That means no golf… and it also means NO PROGRESS AND MORE DOWNTIME. Unless you’re competing as a power-lifter there’s never any need to press with a straight bar on a flat bench. The straight bar bench press isn’t a great chest builder but it’s highly efficient at destroying shoulders. Enough of my ranting… just STOP doing straight bar bench presses. A better exercise is the dumbbell press… with alternating reps. With this movement, you’ll be able to resist the rotation your body undergoes during the rep. Great for protecting your back during the deceleration phase of your golf swing. You’ll start with two dumbells overhead and your arms will work opposite of each other like pistons. The alternating bench press works all the supportive muscles to strengthen the shoulders… and you can easily toss the weights out to your side if you have too much weight. I suggest you just go easy on the weight and instead work on form. Execute these reps in slow motion, working on perfect form. Don’t let your elbow go below your shoulder… or you risk injuring your shoulder. Use the chest to move the weight and tighten your core to resist your torso’s turning. Contract your chest hard at the bottom of the rep and squeeze it until the weight hits the top. And if you really want a better chest, then master the pushup. The pushup and it’s many variations is the master of the chest and core. It’s basically a moving plank if you think about it. The pushup is great your your entire upper body, core, and your shoulders if done correctly. The problem I’ve seen is many guys think they know how to do a pushup but 95% of them are dead wrong. Learn how to do them right like we do in the Get Golf Fit Academy. Start with lower reps and work on mastering the movement. Once you can do a pushup correctly there are countless variations that up the challenge. Learning to do pushups the right way and including them in you training will help you build a lean, muscular, and functional chest, core and shoulders from top to bottom. Focus on the fundamentals and master the technique. To learn how to improve your golf game through physical fitness fast, visit the Get Golf Fit Academy today.